Doesn't that include voting Labour? Here you go again with the one sided angle again trying in vain to delegitimise a perfectly legitimate result. Any comments on the £9 Million tax funded pro-Remain government leaflet sent to every house in UK ? I know you will never accept the fact that legally the referendum had to be advisory. 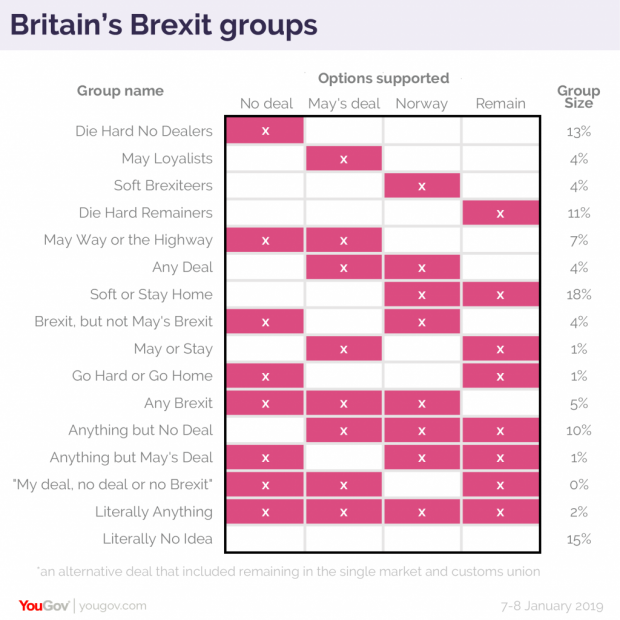 Nor will you accept people have changed their minds, or that there is no consensus between leave voters about what their version of leave meant. Does not change the reality. This is highly irrelevant. Most of the MPs campaigned on Manifestos to honour the Referendum result and to be elected on that premise and then go against it is unacceptable. So to answer your irrelevant question, the answer is most definitely and categorically, no. You seriously trying to argue your case with crap poll data ? So MPs should blithely support their parties manifestos, even though the reality is not what they were expecting, or what in good conscience they can continue to support based on updated information. Just used it to point out how many options there are and that not everyone who voted leave expected the same outcome. But hey, I have learned I will get nothing but derision from you. There is no updated information. Except the over dramatic scare stories from Remainers. Correct but equally it would not make you a traitor to blithely go along with it. I don't believe it will be, there are others who believe it will. Neither can be described as traitors because of what they believe. Perhaps you should stop posting one sided arguments all the time that are easily derided, I see you have completely ignored the issue of the Tax payer funded pro-Remain leaflet. Typical. Manifestos are only as good as the day they are printed. They are not guarantees of what a party will do, merely each parties hope for what they might do when in government. The Tories have already dropped many of their manifesto pledges since 2017. Coming from the man who completely ignored facts not so long ago in this thread by declaring the fact he didn’t need to read a link.